There’s no rest for weary hospital officials and staff as the initial comment period for stage 3 of meaningful use gets under way. An accomplished change management plan can help alleviate staff fears about making the transition to an EHR. Enemies of strong cash flow attack from all sides. How can medical transcription service organizations handle the onslaught? Because of the challenges associated with identifying this collection of disorders, physicians must become more efficient in their patient workups. Follow these seven steps and there’s a good chance you’ll be satisfied with your next coding hire. The advent of more advanced forms of IT has laid an inordinate amount of responsibility at the feet of harried chief information officers. American Sentinel University is offering master’s degrees in nursing informatics. A new online portal is making e-prescribing tools available at no cost. According to a report, physicians faced with mounting HIT demands are bailing out of private practices in favor of larger healthcare groups. A sharply defined, far-reaching communication strategy keeps everyone in an organization on their toes and up to speed. Patient engagement principles are forcing HIM departments to reexamine the means and methods of distributing data. 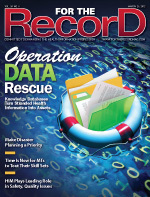 HIM departments are learning that EHRs aren’t a catch-all for document storage. Acclaimed author Roald Dahl not only penned wonderful children’s stories, he also had a hand in developing a device to treat hydrocephaleus. The use of smartphones can help hospitals become more engaged with patients and other caregivers. A study has revealed that websites devoted to prostate cancer are written at an educational level that makes it difficult for many visitors to comprehend the information. A new master’s program in health informatics has been introduced at Weill Cornell Graduate School of Medical Sciences. Embedding questions about physical activity in an EHR gives caregivers deeper insight into the health of their patients. Collaboration between case management and revenue cycle management can produce healthier bottom lines and healthier patients. These professionals are making inroads into the realm of documentation, standing side by side with physicians at the point of care. Connecting speech recognition technology with mobile devices is the next evolution in the quest to make note taking more convenient for physicians. Stage 2 of the landmark initiative expands on the original to presumably make it more challenging for healthcare organizations to earn federal dollars. Is it possible to gain entry into the HIT profession without an extensive IT background? According to a study, EHRs improve both care and overall outcomes for patients with diabetes, especially for those with poor disease control. Facebook has been shown to be effective in creating awareness of sexual-related diseases. Revenue cycle company MedAptus has introduced an ICD-10 solution, while a new consulting firm set its sights on tackling today’s most pressing HIT issues. Incidences of medical identity theft continue to rise, making it more important than ever for healthcare organizations to implement defense measures. Some hospitals have asked doctors to act as counselors to their colleagues to bolster documentation procedures. In the program’s early stages, earning a passing grade hasn’t necessarily translated into more opportunities for job seekers. As illustrated by the case of a young, endearing girl, Angelman syndrome causes severe cognitive impairments that make everyday life difficult. Acute coronary syndrome can be devilish to code, but there are measures coders can take to get the most accurate information into the chart. Florida Medicaid recipients can create an online account to access their health information. Early results from the OpenNotes project show satisfaction on both the patient and physician sides. Palm Beach State College has received a grant to expand its HIT programs. Learn about the Inpatient Prospective Payment System final rule for 2013, which increases hospital reimbursement rates and delivers details on the upcoming Medicare pay-for-performance programs. To earn federal dollars, accountable care organizations will have to meet 33 standards spread across four patient care domains. Text messaging has proven to be an effective healthcare aid overseas, but some question whether similar business models are sustainable in the United States. Physicians and hospital staff may need to reevaluate procedures to reduce infections and other complications stemming from urinary catheterization. Carpal tunnel syndrome can be devastating to medical transcriptionists who depend on their wrists and hands for their livelihood. Learn more about the misconceptions surrounding this condition. According to a Nuesoft Technologies survey, concerns about the transition to ICD-10 are weighing heavily on physicians. Health Level Seven International has released Trifolia Workbench, which boasts a host of clinical document architecture templates. By measuring coding accuracy, healthcare organizations can get a better read on coder performance and potential revenue losses. Establishing such standards would make it much easier for facilities to purchase, share, and implement CDS tools. Researchers have found that using natural language processing in tandem with EMR data can lead to quality improvement and better care outcomes. Serious health problems are sure to follow if steps aren’t taken to address this seemingly unavoidable condition. 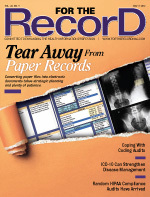 Find out what happened to paper medical records when a Philadelphia-area health system implemented an EHR. Industry experts offer three pointers for how to avoid potentially disastrous errors when financing an HIT project. According to a KLAS report, more healthcare providers are turning to consulting firms to help them meet meaningful use requirements. A cloud-based solution provides hospitals with the flexibility needed to respond to evolving transcription needs. Better not cram, say experts, who recommend developing sound testing strategies well in advance of the coding system’s arrival. By making good use of large volumes of invaluable data, healthcare organizations can improve their chances of meeting several federal regulations. The Direct secure clinical messaging platform allows participants to send encrypted health information to trusted recipients. Primary care physicians can play a key role in detecting glaucoma symptoms and saving patients’ eyesight. An industry expert explains the differences between health and wellness apps and the clinical and behavioral sophistication of mobile integrated therapies. According to a study, US physicians have less desire than physicians in other countries to use social networks to connect with their counterparts overseas. 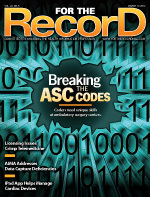 In the industry’s ongoing quest to release as many ICD-10 tools as there are codes, a new TurboCoder makes its debut. Research indicates some patients are one-half as likely to receive depression treatment in primary care practices that use an EMR as they are in practices that deploy paper-based records. 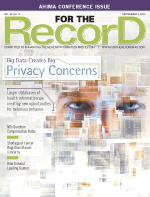 Larger databases of health information are creating new opportunities for improper access and potential breaches. The perfect storm—an increase in cancer programs and a decline in new registrars—has created a prime opportunity for HIM professionals considering a career change. Leading queries can have serious ramifications, making it imperative to present the appropriate options to physicians. Medical transcriptionists are questioning whether they can survive on the current pay scale. Patients who utilize PHR tools are more likely to seek preventive services, including cancer screening and vaccinations, according to a Virginia Commonwealth University study. Affordable and readily available HIT can help the United States better defend against the ravages of diabetes. A partnership between NextGen and Health Language is designed to ease the transition to ICD-10 by enhancing provider documentation and billing workflow. Research is under way to determine whether an online social network can enable better diabetes care. Project Synapse delves into the facets and features that can make EHRs more patient friendly while still taking clinician preferences into consideration. Online patient communities are creating powerful forums to help individuals take control of their care. Whether front end, back end, EHR based, or traditional, dictation processes need to align with an organization’s workflow. New developments focus on the disease’s source and the effects of aggressive antibiotic treatments. According to a study, using an EMR to review images during daily radiation treatments dramatically improves compliance with timeliness and record keeping. In an era when quantity often collides with quality, medical transcription service organizations debate how best to use productivity reports. A national health policy group has identified 11 tools with the potential to affect how patients and providers interact. Poor communication and a logjam of appeals are just two sticking points cited by HIM professionals. Instant notification of potential documentation errors may benefit everyone from physicians and HIM professionals to patients. At a Wisconsin healthcare system, radiologists and gastroenterologists are setting aside differing viewpoints on colon cancer screening. The New York City Department of Health and Mental Hygiene is partnering with Dossia to offer PHR tools to the members of five churches. New considerations in data reporting and payment have changed the previous DRG monarchy to more of a critical data reporting collaboration. A survey found that 72% of respondents wanted to be able to book, cancel, or change their physician appointment online. The latest data show California physicians are struggling to meet meaningful use standards, while a survey details their nationwide colleagues’ frustrations with EHRs. 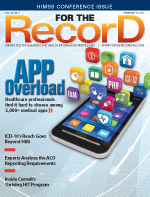 A coding report and a dictation app are two options for busy healthcare organizations looking to save time and money. The definition of “other services” has led to a CMS clarification on how the rule should be applied to certain outpatient services. Equipping rural hospitals with high-speed networks has numerous benefits, but the plan faces several hurdles. Chief among them is funding. Mobilized with smartphones and tablets, clinicians for California’s Sutter Care at Home take the organization’s EHR on the road. When the CDC announced statistics indicating the highest number of measles cases in 15 years, infectious disease specialists took notice. The federal government has released version 3.0 of the ONC Health IT Curriculum Project. Two Canadian coding experts share their experiences on how best to deal with coding diabetes in ICD-10. Three New York HIEs and three vendors have partnered with the New York eHealth Collaborative to facilitate data exchange. AARP Health Record enables users to enter, store, and edit their personal health information in a central location. It takes a team effort, including support from HIM and coding, to keep a hospital’s finances in proper working order. 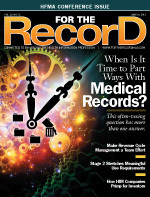 When Is It Time to Part Ways With Medical Records? Industry experts offer their opinions on how best to address this complex issue. The soon-to-be final rule for meaningful use part deux pushes forward the idea of being able to seamlessly share data between patients and providers. According to the CDC, 15% of new STD/HIV infections occur in adults over the age of 50. Clinicians must be proactive in improving prevention and providing education. Developed by University of Pennsylvania researchers, an EMR tool demonstrated it could cut down on unnecessary emergency department CT scans. In an era when more HIM vendors are considering expanding their services, finding the right growth partner to help guide the process is imperative. 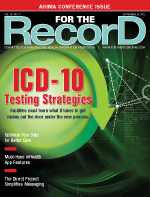 An industry veteran tries to dispel several myths concerning ICD-10 adoption. The newly introduced Health System Measurement Project helps industry professionals, policy makers, and the public track healthcare trends online. TEPR founder C. Peter Waegemann has released a new book about the enormous effects of the digital revolution on human intelligence. Connect computer-assisted coding technology to other hospital systems and watch the technology’s value increase. Solid documentation practices and careful planning can lessen stress levels when federal auditors come calling. 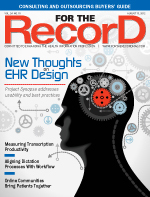 To be better received, EHRs need to adapt to physicians’ longtime love affair with dictation. Commonsense safety measures and the latest research are helping to take the sting out of tick bites, sunburn, and poison ivy. A group of New Jersey oncology nurses has created a user-friendly checklist to help better document patient care. A bevy of strategies and resources can help overwhelmed chief information officers find and attract qualified HIT talent. Text message reminders to receive flu vaccinations appear to improve immunization rates in low-income families, according to a study. A new consultant development initiative addresses HIT staff shortages. By performing a gap analysis early on, hospitals will be able to determine the amount of work needed for the transition to ICD-10. Healthcare organizations need to account for these factors if they are to successfully meet the qualifying guidelines. Test results, discharge instructions, and provider messages are examples of the types of data that can be exchanged through this Web-based tool. For pharmaco-resistant patients, this treatment option can provide relief from the disabilities that hamper everyday life. The Colorado Regional Health Information Organization has released a report examining issues related to sharing behavioral health data through HIEs. An industry veteran examines the pros and cons of working either in an office or as an at-home independent contractor. Employing a document management system to convert paper files into electronic documents takes strategic planning and plenty of patience. Experts weigh in on how the Office for Civil Rights’ plan to conduct random compliance audits will affect HIPAA policies and procedures. 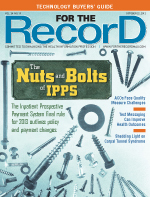 The arrival of recovery audit contractor prepayment reviews spells more administrative headaches for hospitals. More descriptive data could pave the way for better care and treatment. IBM’s has agreed to use its supercomputer Watson’s humongous knowledge base to help a leading healthcare organization improve cancer care. Thanks to their relationship with hospital-acquired conditions, catheter infections pose unique challenges to coders. According to a study from the University of Buffalo, parents of children with cancer are reluctant to use the Internet to learn more about their child’s disease. Three organizations have teamed to offer services designed to help hospitals cope with the transition to ICD-10. The ability to exchange health information is wonderful, but it defeats the purpose if it’s incorrect data. 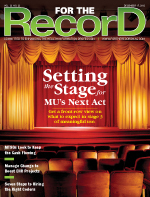 Medical records may not get to where they need to go if hospitals don’t properly plan for the general mayhem that ensues during an EHR conversion. Three studies mull over the effectiveness of speech recognition. A comprehensive study shows that combining certain nutrients with dietary and lifestyle modifications may help slow the progress of this potentially deadly condition. 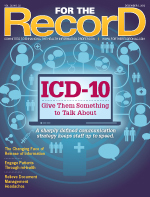 A pair of reports dig deep into how healthcare organizations are preparing for ICD-10 and the effects of Health and Human Services’ decision to push back the implementation deadline. Competency exams offered by the American Society of Health Informatics Managers and the federal Workforce Development program offer HIT professionals a chance to tout their knowledge. Context awareness technology provides real-time patient data that is specific to clinicians’ needs. Correctly distinguishing between inpatient and outpatient status can save hospitals from lost revenue and compliance headaches. New rules, regulations, and technology have complicated matters when it comes to gathering cancer data. At-Home CDI — A Remote Possibility or Something More? While a remote clinical documentation improvement program has been successful at Kaiser Permanente, some experts question whether it’s viable at other institutions. According to a study, more abdominal gunshot and stab wounds are being successfully treated without surgery. New analysis from research firm Frost & Sullivan predicts increased use of PHRs, but direct revenue opportunities remain limited. 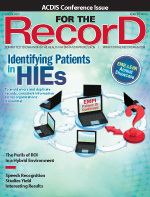 Don’t know the right questions to ask when buying an EHR? These helpful hints should provide a solid base to make the process less painful. 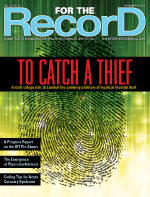 A Tennessee medical center’s HIPAA strategy includes taking advantage of a Web-tracking tool. AHIMA has debuted tools to better manage the integrity of EHR documentation. Through “knowledge discovery,” the meaning lying within infinite reservoirs of data can be recognized and put to good use. By compiling and securing nearly every inch of a hospital’s patient data, HIM professionals are uniquely positioned to create better care environments. Business continuity and disaster recovery plans are invaluable resources should a healthcare organization suffer a data loss. A lack of sleep can have a ripple effect on health and well-being, but there are several options available to help patients get some productive time in the sack. According to a survey, EHR adoption has made strides over the past year, but interoperability is still a significant obstacle. A veteran HIM professional makes the case that the industry could make better use of medical transcriptionists’ skill sets. University teams have earned kudos for their work in developing healthcare solutions that take advantage of social media and mobile technology. A dictation system gives physicians the choice to dictate, type, or “touch” their clinical documentation. It takes a unique set of skills to master the nuances of coding at an ambulatory surgery center. The requirement that physicians be licensed in the state where the patient is being treated has hampered the growth of telemedicine. AMIA is set to release guiding principles that address the shortcomings of electronic data capture and documentation. More common among hospitalized or institutionalized elders, these bacteria often affect patients with compromised immune systems. 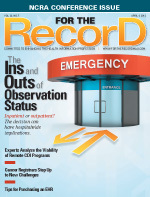 University of Michigan researchers say more needs to be done to boost EHR communication with immunization registries. An electrophysiologist has developed an iPad application that can manage cardiac devices remotely. The Rural Assistance Center has introduced an online tool kit designed to help rural healthcare providers get HIT projects up and running. 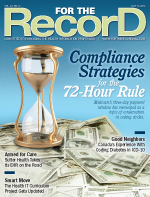 Kforce Healthcare and Elsevier/MC Strategies are the latest companies to join forces to offer ICD-10 education. 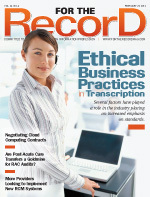 As concerns about the security of protected health information have increased, the medical transcription industry has reevaluated its handling of patient data from a transparency standpoint. 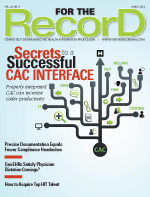 Are Post-Acute Care Transfers a Goldmine for RAC Audits? Not knowing whether patients ultimately follow through with postdischarge plans can have significant financial and compliance ramifications. 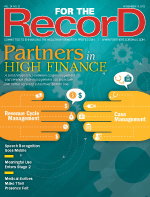 When constructing contracts with cloud computing vendors, industry experts recommend including several must-have items. Researchers seek objective measures to an elusive problem plaguing many of our nation’s military service members. A lack of funds is preventing more healthcare organizations from participating in health information exchanges, according to a Beacon Partners study. Industry experts provide pointers for the numerous providers looking to make the switch to a new revenue cycle management system. St Jude’s Children’s Research Hospital hopes to accelerate pediatric cancer discoveries by sharing findings on an online genome database. For hospitals befuddled by the transition to ICD-10, there are two more options on the market designed to help make the process run smoother. Experts agree that the effects of the transition to the new coding set will be felt across entire organizations. For the first year of the program, the Centers for Medicare & Medicaid Services has emphasized quality measurements. Choices abound for healthcare professionals who value mobility and easy access to data. Baby boomers and booming waistlines have led to an increase in the number of people opting to go under the knife. Hospital nurses working with EHRs consistently reported more improvements in care than did those working in facilities without the technology, according to researchers at the University of Pennsylvania School of Nursing. With help from a federal grant, Weill Cornell Medical College is developing tomorrow’s class of HIT thought leaders. A health literacy social media program geared toward helping California teens become knowledgeable healthcare consumers is being taken nationwide. AHIMA has introduced an ICD-10 training program tailored to specific healthcare settings and roles. 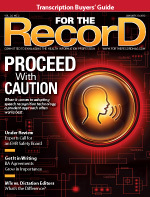 Experts advise healthcare organizations to consider other factors besides cost before plunging into a speech recognition environment. Covered entities are largely responsible for the actions of business associates, making their agreements all the more significant. 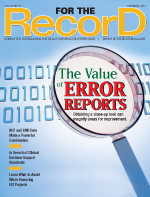 More scrutiny of EHR systems is needed, say informatics leaders who suggest the creation of an EHR board to review errors. Scientists are working diligently to uncover new ways to attack a disease that has taken a huge toll on the nation’s health. An industry veteran attempts to differentiate between medical transcriptionists and dictation editors. A study published in the Annals of Internal Medicine measures physician and patient attitudes on sharing medical notes. A start-up health network features a free Q & A service in which consumers anonymously ask questions to approved doctors. Unsure of your staff’s ICD-10 prowess? An online assessment tool measures their knowledge of the rules and regulations governing the new coding guidelines. 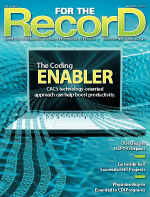 Computer-assisted coding can be a valuable tool for healthcare organizations looking to gain an edge in productivity. Obtaining physician buy-in is an essential ingredient to a successful clinical documentation improvement program. Health systems in Delaware and Texas serve as examples of how HIT can raise standards and improve workflow. Advanced technologies can reduce patient discomfort, recovery times, and the cost of care. The number of data breaches involving protected health information rose by 32% from 2010, according to research by the independent privacy and data protection group the Ponemon Institute. 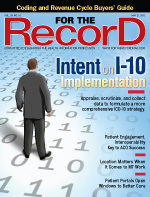 Three health system chief information officers discuss ICD-10 implementation, including the progress made thus far and the challenges that lie ahead. Experts say plenty of work needs to be done before consumers can feel comfortable with the results they find on physician rating websites. 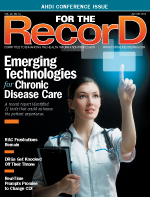 A new iPad offering helps home health clinicians capture documentation in a secure and HIPAA-compliant manner.